Our NPO allows our office to run with such efficiency that we guarantee that 90% of your visits will be less than a 10-minute wait if at all! We will discuss how the body functions, how chiropractic care works to bring back your health and how we can get your care for at least a 50% discount. This is only time that new patients/clients view their initial x-rays. Bring your spouse and receive a $20 dinner gift certificate. You will review the “Your Report” videotape. The subject of this video is an explanation of what the doctor of chiropractic is looking for when he or she takes the x-rays and examines your spine. 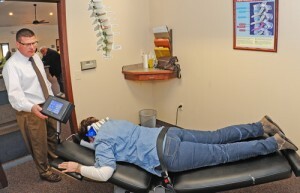 The video explains a process called “subluxation Degeneration.” The phase of subluxation degeneration of your spine is the basis upon which the doctor makes his or her recommendations for restoring your health. This video lasts approximately 9 minutes. 1) how do I know if chiropractic can help me? 3) How does chiropractic work? After the presentation, Dr. Goss answers questions that you may have about chiropractic or about anything he mentioned during his presentation. We will briefly go over our fees and your choice of care plans. We have two care plans from which you can choose, based upon your individual health care goals. You decide how much or how little of chiropractic care you wish to deserve. After the new patient orientation presentation, you will be given your “report of findings.” The report will focus on your specific problems, your x-ray and exam findings, our recommendations that will produce the quickest results in your case, your options of care, and answering your questions. After your report of findings, we will ask you to choose from one of our two care plans. We will answer any questions regarding fees and insurance issues that you may have. This financial consultation usually takes about 5 minutes. We will make every effort to make chiropractic care affordable for you. Because of the importance of the New Patient Orientation as providing an educational foundation for your care, we hold several convenient sessions per week. Plan on the entire process taking approximately an hour. Please let us know if there is a scheduling conflict with your work or school. If necessary, we will provide you with a written excuse to allow you to attend the very important appointment. It is very important that you make every effort to have your spouse attend the NPO. Back problems are extremely common and many times they are dismissed as a self-limiting ailment. Actually, they can be a very serious disabling condition that, without proper treatment and life style changes, can be permanent. 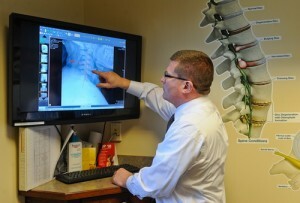 We want your spouse to see your x-rays so we can enlist their support in getting your spine corrected. There may be times that your physical activity at home may have to be modified. We want your spouse to understand so that they “honey do list” does not end up hurting you and interfering with your care. Getting results that we both desire requires adherents to your specific schedule of care. If you can make appointments and keep them that is fantastic and it helps tremendously. However, appointments are not required. What’s important is that you maintain the right number of visits per week that the doctor has prescribed in order to get you well. If you miss an appointment please make it up that week so you maintain the appropriate number of adjustments per week that the doctor has prescribed. If you are unable to make appointments at a specific time please always schedule at least the day you will be in. Therefore, we can keep track of your schedule so we know when re-exams should be performed. In the event that you cannot make a scheduled visit always call us so we can make arrangements for a makeup visit. If we don’t hear from you, we will call and leave a friendly reminder on your answering machine. We want great results for you and the only way to get them is by keeping you with your treatment plan. Your Regular visits will not be as long as your first or second visits to Goss Chiropractic Clinics.